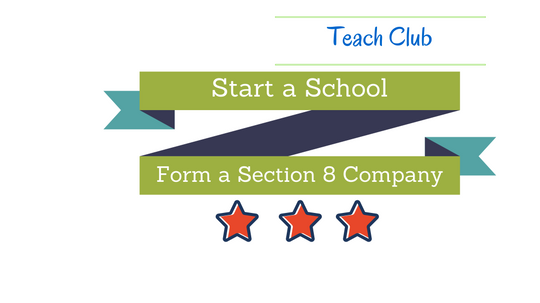 A school can also be opened by starting a Section 8 (Old Section 25) Company. 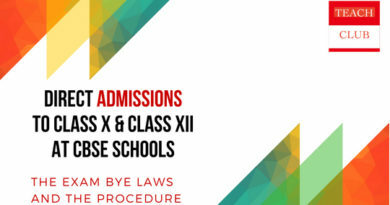 CBSE made amendments to its bye laws making Section 25 / Section 8 Company qualified to start a school. 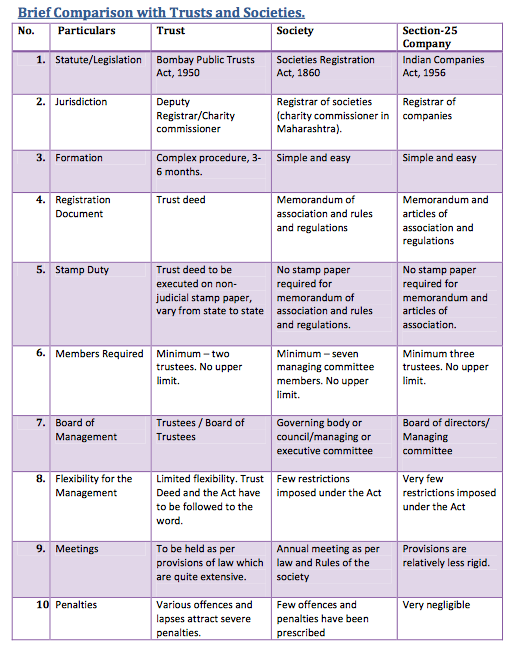 In India, a non-profit organisation can be registered as Trust by executing a Trust deed or as a Society under the Registrar of Societies, or as a private limited non profit company under Section 8 Company under the Companies Act, 2013. A Section 8 Company is the same as the popular Section 25 company under the old Companies Act, 1956, which was one of the most popular forms of Non- Profit Organisations in India. But, as per the new Companies Act 2013, Section 25 (as per the old act) has now become Section 8. Those who want to promote charity without creating a Trust or a Society for the purpose. It allows the formation of a company, which will exist as a legal entity in its own right, separate from the person promoting it. Any company under this section must necessarily re-invest any and all income towards promoting the said object or charity. In essence, unlike a regular company, where owners and shareholders can make profits or receive dividends, no money gets out of a Section 8 company. A Section 8 company is often preferred because it is easier to start — being exempt from statutory requirements of minimum paid-up capital. They are much easier to run than Trusts and Societies, as board meetings require a smaller quorum and requirements for calling such meetings are less rigid. It is easier to increase the number of directors, it is easier for people donating money to join or leave or transfer shares to others, and such a company is obliged to fulfill far less stringent book-keeping and auditing requirements as against a regular company. A Section 8 company enjoys significant tax benefits. Depending on how it is registered under the Income-Tax Act, companies could benefit from income-tax exemptions, or from the provision wherein people donating money to these companies receive income deductions in their income-tax liability. Such companies are also exempt from stamp duty payments. Section 8 is preferred by several businessmen because they are conversant with the company structure, while benefits from several exemptions make it easy for philanthropy. The question then arises why to form a Section 8 Company, which involves greater paperwork, cost and has somewhat stricter provisions in many areas? The most obvious answer is provided by the advantages of having an incorporated company, namely, independent corporate entity, limited liability, perpetual succession etc. Section 8 companies enjoy greater privileges in the form of concessions allowed under the Act to such companies. Central government should have granted a license to such a company recognising them as such. The powers of granting licenses have now been de‐regulated from the Central Government to the Regional Directors. The Company may not alter its object clause without the permission of the Central Government. The Company may not alter its Article without the permission of the Central Government. That the company shall not pay remuneration or other benefit to any of its members. This is applicable even though they are officers/servants/office bearers. Any member working for the association has to work in an honorary capacity. What can be paid is reimbursement of expenses, interest on loan, rent for premises lent to the company. Here is a screenshot which I have taken from the website communityofevaluators.org. Here is the link. 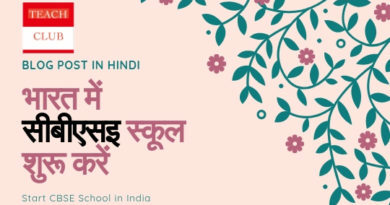 Private, unaided schools established by Societies registered under the Societies Registration Act 1860 of the Government of India or under Acts of the State Governments as educational, charitable or religious societies having non-proprietary character or by Trusts or #Companies registered under section 25 of the companies Act of 1956 of the Govt. of India. i) The State / UT Government does not have any objection to school being run by a company under Section 25 of the Companies Act, 1956 at its jurisdiction. Obtaining NOC — Companies which want to start such schools should secure a no-objection from the State or Union Territory government. They should have a memorandum of bylaws wherein education must be one of the objectives and they should not channelise funds of the institution for purposes other than education. The school seeking provisional affiliation with the board must have formal prior recognition of the State/Union Territory government. Its application should be forwarded by the State Government or there should be a no-objection certificate to the effect that the State Government has no objection to the affiliation of the school with the CBSE. The school/society/trust/company registered under Section 25 of the Companies Act, 1956, or the congregation or other religious body controlling the society/trust/company registered under Section 25 of the Companies Act, 1956, managing the school must have about two acres (or as otherwise permitted measurement) of land and a building constructed on a part of land and proper playground on the remaining land. The company should ensure that the school gets proper land, building, equipment, furniture and qualified staff at least as per the norms of the board. The company should ensure that the school is run as a community service and not as a business. Commercialisation should not take place in the school in any shape. The company should safeguard the autonomy of the Principal and provide him total support except when the Principal goes against the established and clear directives laid down by the management. Teachers said that efforts should be made to ensure that quality does not get diluted in schools run by companies. 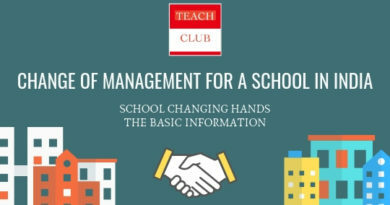 I hope you all find this information very useful as it gives a new dimension to the way schools have been formed pre 2008. Your comments are invited. Well done job on private company, your blog is really well written.